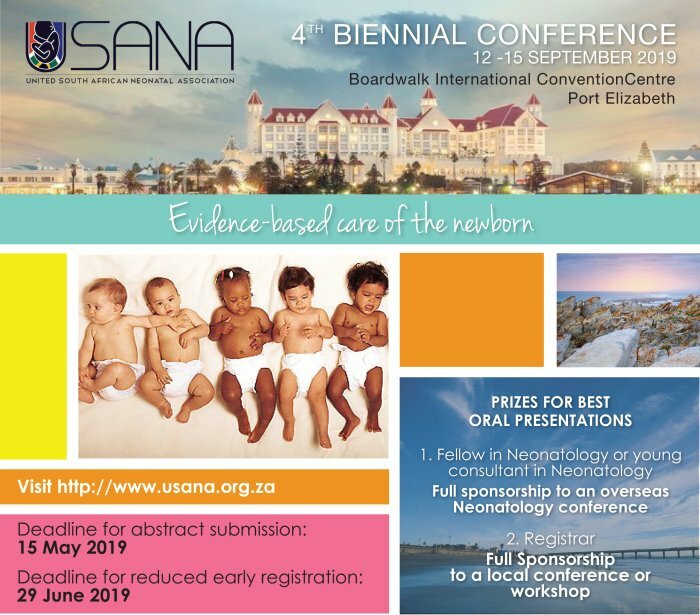 The United South African Neonatal Association (USANA) is pleased to announce the 4th Biennial USANA Conference to be held at the beachfront “Boardwalk International Convention Centre”, Port Elizabeth, 12 – 15th September 2019. Port Elizabeth is known as the friendly city and is situated in the Eastern Cape Province close to the picturesque Garden Route. The theme of the conference is “Evidence Based Neonatal Care”. A number of international and local speakers will be attending to share their research and expertise. Prominent invited and confirmed international faculty includes Adre du Plessis (USA), Floris Groenendaal (Netherlands), and Peter Reynolds (UK). Neonatal care covering a wide range of topics will be presented, including a session dedicated to medico-legal issues and ethics. Registrars and Fellows are encouraged to present their neonatal research to stand a chance of winning a prize. A gala dinner will be held where the awards for the best presentations will be made. Participation is open to neonatologists, neonatologists-in -training, paediatricians, paediatric registrars, general paediatricians with a special interest in neonatal care and neonatal nurses from both the public and private sectors. Please register early to secure your place for this exciting conference. Register to be a USANA member to qualify for a discount on the registration fee. We look forward to welcoming you to the friendly city in 2019!